Podere dei Castagni is part of a beautifully restored old farmhouse nestled in the hills of the Val D’Orcia beneath the gentle slope of Monte Amiata (1738 m.). The house has a charming, country feeling, and is set in a quiet, wooded three acre property with many plantings and stonework. The interior of the house is clean and bright. The first floor is large and open, with a kitchen equipped for cooking including oven, refrigerator, microwave, toaster, American coffe maker all new . A living room with a large traditional Tuscan fireplace, and a bathroom with shower. It is filled with natural light and views of the surrounding gardens. On the second floor are two bedrooms and a bathroom with shower. The house is furnished with local antiques and original artwork. Architectural details include cotto tiles, wooden beams, local stone, and doors from a medieval bell tower. The house’s elevation and ventilation afford cool and comfortable nights during the hot Tuscan summer. Laundry/washer on site. Further Details: The location of the house is located 15 minutes walk from the medieval town of Abbadia S. Salvatore on the bottom of the Monte Amiata , an ancient extinct vulcano famous for its mineral hot water springs and porcini mushrooms during season. The house is ideal to relax and cool off during summer and discover the beauty of less explored area of Tuscany. There are several restaurants that offer excellent traditional cuisine and wines. Its location is ideal for exploring ancient southern Tuscan towns such as Siena , San Gimingnano ( 60 km by car) Pienza and Montepulciano, ( 25-30 kms by car) as well as neighboring Etruscan Umbria ( Chiusi 45 kms by car) . Florence is an easy day trip away ( 150 Kms by car). One can also explore numerous charming villages like Vivo d’Orcia which dot the mystical countryside of the Val D’Orcia, one of the most beautiful natural areas of Tuscany and a recently designated a UNESCO World Heritage Site. If the Tuscan sun gets too intense, you can take refuge in the cool mountain forests of Monte Amiata. Here one can take long walks, hike, ski or even hunt for the prized Porcini under a shady canopy of Beech and Chestnut trees. The town of Abbadia San Salvatore, with its ninth century abbey, medieval Borgo, restaurants, shops, a large swimming pool and tennis courts is within walking distance. You can relax and renew yourself in the healing thermal waters of San Filippo (17kms) or Bagni Vignoni (28 Kms) which are fifteen and twenty five minutes by car. Bagni San Filippo offers also natural pools in the forest with water a different temperatures. A fun destination also for families. Important Etruscan areas, the Maremma, and the Mediterranean coast are an hour and half drive. Roma Fiumicino and Florence are the closest airports. I am an italian architect and landscape architect living in USA. I love restoring old houses transforming them in special places and share them with other people that love traveling. This is a special place that offers modern confort combined with beautiful antique furniture immerse in a cool green garden. a great advantage of this property is that is set in the countryside but is 15 minutes walk to town where everything is available. The property is 1.5 ha and around the house there is a fence including 0.7 ha of garden. This offer security for the guests and their children. there is a tennis facility in town where it's possible to rent the courts. For swimmers there is a great public pool in town ( 5 minutes drive) for reasonable fees. Large garden with outdoor furniture, Hot springs (San Filippo, Bagni Vignoni). Guided horseback riding. Large open garden. Telephone: for emergency calls. Mountain View, Ski-Out. Off Street Parking: Private parking in the property. Wood Fireplace. During winter/spring our rates include heating. This house would be a better choice in the summer, when it's warmer, and the evenings are lighter later. The property is lovely and it would have been nice to be able to be outside more. Things in the house are very basic, no extras that you find in other homes. The house was extremely cold, and we were surprised to have to pay extra 30e a day for heating. I was told this was because of lower off season rates but reality is you have to have heat so less of a bargain. This isn't the place if you have allergies , the place was very musty since it isn't heated ahead of time and there were lots of dust bunnies and cobwebs in the fireplace , in the some of the decorations, and we made the mistake of trying to adjust one of the clamp lights in the kitchen revealing a thick layer of fuzz. When we arrived there was some confusion with directions and we spent 90 minutes once we were near the town trying to figure out where we went wrong. I couldn't load the App to communicate with the owner as she preferred and her mother wasn't able to help us over the phone because of the language difference. She was very nice once we arrived. The house is a long drive to Siena, Montalcino etc. and Hwy 2 was not as major a road as the maps make it look like. We ended up not seeing as many places as we hoped as it was a bit treacherous driving after dark - there were a couple of restaurants we'd read about in near by towns but we didn't wantto go back on the roads in yhe evening. . If you're looking to visit more of the southern hill towns of Tuscany , this is a good location. This review is really surprising to me. Everything seemed fine when we spoke on the phone during your stay. I know you were upset about having to pay the heating fee after you left but that is something that is clearly indicated on the website and in the rental agreement. Unfortunately we had heavy rains for two weeks before you arrival at the beginning of November but usually the house is very dry and comfortable. I am not sure what are your parameters of basic or extra but the house is very well equipped with new appliances(refrigerator, cooktop, oven, flat screen TV, fans) WI-FI, and our guests have always a test of great homemade pies. In the 11 years that we have rented the house we never had a guest disappointed about cleanliness or the condition of the house. We always make every effort to make our guests comfortable and we respond promptly to requests. I am sorry you had trouble to reach the place at night. We recommend to all our guests to download a texting app before their trip so we can assist them at the house and while traveling. Several of your comments are not accurate or have nothing to do with the house itself. The location is easy to find on maps to verify distances and roads classifications. Definitely, most of our guests prefer summer vacations. This is a stunning place to stay - a lovely house in idyllic surroundings. Comfortable beds and well equipped. Eleanora was wonderfully welcoming, and really helpful in giving us tips about the local area. Highly recommended! Jo and her family were great guests and very enthusiastic. We are glad our guests had a relaxed and comfortable stay and we hope having them again. It’s our endeavour to help our guests to have a relaxing stay and enjoy what the area can offer. My family wanted an authentic slice-of-Italian life experience in the Tuscan countryside, and our stay at Eleonora's lovely home, Podere dei Castagni, was just about heaven! The house is situated on a large piece of land, with lovely views of green pastures and rolling hills. The photos are absolutely accurate - it's a restored stone farmhouse, with deep set shuttered windows, solid construction and good natural light. The two bedrooms upstairs are comfortable and private, we slept great. The baths are nicely updated, the upper one benefits from a view into the front garden. The kitchen has all the essentials, although we rarely cooked (there's just too much amazing food to be had in this area.) The food in Tuscany is truly the best! Eleonora's mother greeted us in the classic style - with a bottle of Vin Santo and little cantucci.. She lives adjacent with her well-behaved dog, and is available if needed, but otherwise not intrusive at all. Later in the week, Sandra showed us her house, which is filled with her absolutely stunning ceramic works. Yes, our limited language skills were put to the test. Eleonora was always responsive by email with good suggestions. The gardens surround the house and kind of ramble and tumble down the hillside, offering shade and sun, fruit trees, climbing roses, clumps of rosemary and pots of basil. It's all very restful and bucolic. We really appreciated how much cooler and fresher the air is at this elevation. Walking into town takes 12-15 minutes along a country road. There's no sidewalk for the first part, so you do need to be aware of approaching cars, but the road isn't too busy. I would definitely drive after dark. Parking doesn't seem to be a problem in Abbadia SS. Abbadia is a nice sized town -- small enough to get a real sense of the place, but big enough to have a good grocery, pharmacy, several good restaurants, nice plazas and parks. Don't miss the medievel section, which I stumbled upon one morning, getting lost and found in the winding lanes. We did day-trips to some of the more famous/touristy Tuscan towns, but we would have been happy to spend nearly all our time in and around Abbadia. It has a special charm and easy access to Mt Amiata with all kinds of hiking trails and spectacular views. We Loved It! Thank you for all your comments. It Makes me happy that our guests enjoy the house and the town which is off the tourist track but still very interesting from many points of view. We hope you can visit again. My husband and I had a wonderful stay at Podere Castagni. with fruit from the orchard. 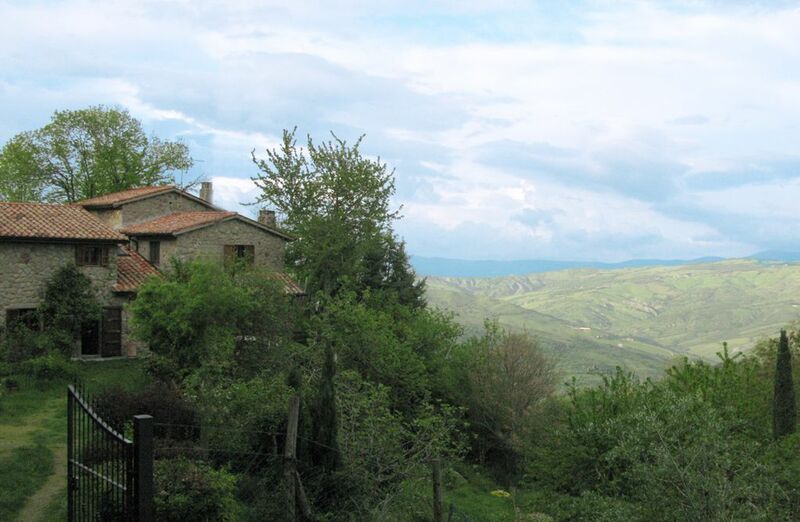 The house is beautifully located in the Tuscan hills in the middle of Val d'Orcia. Very convenient and close to town. Abbadia is a lovely town with a medioval borgo and excellent restaurants. We did several day trips in Pienza, Montalcino, Siena and Bagni San Filippo. We liked the peaceful setting and our breakfast in the garden. We'll be back. We are pleased that you enjoyed your stay at Podere Castagni. Parfaite destination pour une famille de quatre personnes. La maison avait un charme fou: restauree par la fille de la proprietaire, architecte, elle etait aussi tres bien entretenue et tres propre. Le jardin etait merveilleusement fleuri et tres bien agence - un regal pour les enfants! La proprietaire ne parlant pas anglais, les dialogues ont donne lieu a des rigolades et jeux de mimes et elle a su regaler les enfants avec des gateaux faits maison. La region regorge d'activites en tous genres et Abbadia San Salvatore est une mignonne petite ville loin de l'agitation touristique, ce qui lui confere de serieux atouts. Les bains de San Filippo, Bagno Vignoni, le sommet Amiata (super plan en ete quand il fait tres chaud en plaine), Montepulciano, Montalcino, Pienza, la splendide Sienne, Orvieto, etc. sont des destinations aisees en une journee. Seul hic: pas de filtre a eau et des canalisations defectueuses en ville donc il fallait s'approvisionner en eau minerale - et pas de machine a laver. Mais le charme des lieux, la gentillesse de la proprietaire et ses bons plans 'pizzerias, traiteur' nous ont fait tout oublier!! A recommander. Abbadia San Salvatore, 70 Km South of Siena.